The diamond palette is the series of personalized fragrances. These perfumes will be devised after a laborious informational analysis, pertaining to the character and sensorial dimensions. Steps are led during 3 days of creation, when out of 128 essences, 21 will be chosen. The essences will be set out during the act of wearing the perfume for 9 hours. Each olfactive note will be the eco of an emotional concert. The experience of personalized creation is unique, and the finality of this creation will materialize under the form of two bottles with alchemical nectar, one as Eau de Parfum and the other one as Parfum. 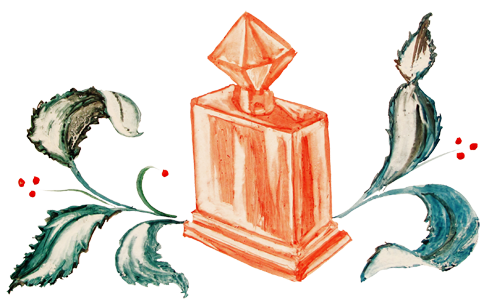 The personalized perfume in the form of Parfum will be developed in the laboratory of Grasse, France. The technique is laborious, since the difference pertains to molecule processing, besides concentration. The perfume in liquid form will pass to the fume form that will be refrigerated and stabilized, and in the end, the liquid form will be recomposed again. The duration of this procedure is ~ 1 month, and the result is the most refined form of perfume which exists. The end of atomising the perfume is the joy of recapture.